Stunning Red Bracelet in Red pearls classy simple new bracelet with rhinestone rings spacer wedding jewelry very economical fashion jewelry for everyone offers you affordable designer bridesmaid Bracelet Flower Girl Bracelet Rhinestone Bracelet. Beautiful Bracelet with matching earrings interwoven style. 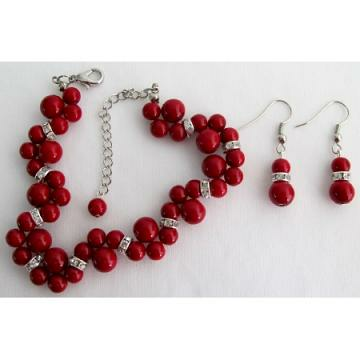 Material Used : Red Glass Pearls 6mm 8mm with interwoven bracelet & earrings with rhinestone spacer. This item in Bracelets & Bangles category was first added to our catalog on 11-07-2015. Buy Wedding Popular Items In Red Pearls Twisted Bracelet with Matching Earrings, sold & shipped by Fashion Jewelry For Everyone where you can shop online for Leading Online Retailer for Indian Fashion Jewelry. This Bracelets/Bangles collection has been tagged as Wedding Bracelet,Wedding Earrings,Red Pearls,Red Bracelet,Red Earrings,Pearls Bracelet,Pearls Earrings,Twisted Pearls,Twisted Earrings,Bracelet Pearls,Bracelet Earrings,Matching Bracelet,Matching.